The Weisz Teacher's Blog: New Year, New iPads! Welcome back! This year promises to be an interesting one as we take our One to One program to a new level. Instead of each middle school student having laptops, this year they all get brand new iPad's! As an added bonus, the high school students will now all have their own laptops! The extra good news is that this year, the iPads can be taken home. The high school will still keep laptops at school. Middle school students with iPads will notice fewer textbooks this year. There will be no textbooks for 6th and 7th grade English, Social Studies, or Math, as we have all the materials you will need on the iPad or online! During the first week of school the iPads will stay at school, but as soon as we are able to review the new One to One plan and contract with parents, they can go home! The other new change is that the middle school students will all be taking a new technology course. During this new course, we will explore the iPads further as learning tools, learn more web tools and most importantly - digital citizenship! 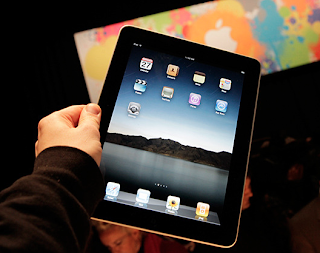 Students will get more information about the iPads during the first days of our technology class - stay tuned!